What do I need to do in order to attend the Job Forum? No sign ups are required. Please arrive at 6:20 and plan to stay until 8:30. We will assist as many job seekers as we can. If your situation is not discussed, due to time or number of job seekers, you may request to be among the first another week. What is the dress code at the Job Forum? Business casual appearance (or better) and professional courtesy are requested. What shall I bring to the Job Forum meeting? You may wish to bring the printed version of your resume and a printout of your LinkedIn profile. You can bring business cards to share with others. Will you review my resume at the Job Forum? Yes, if you bring copies of your resume and want to ask questions and get advice on how to fine-tune it, we will certainly give you useful feedback. If you do not have a resume that you are proud of, or fear that yours is not yet adequate, we can recommend resources for you to work with, one on one. What if I do not have LinkedIn? It is advisable for most job seekers to be on LinkedIn. It is the largest online repository of professional connections. There are approximately 467 million people on LinkedIn. Approximately 107 million of these are in the USA. Will you comment or assist on my LinkedIn profile at the Job Forum? Yes, please print a copy of your LinkedIn profile and bring it along with you, this will make it a bit easier than reading it on our cell phones. How do I review someone’s LinkedIn profile without them knowing I did this – especially if I do not know them or if I later want to apply for a job working for them? It is helpful and useful to view the profiles of other people in your field to understand what is expected and needed for landing a job in each field and for each job title. You can also gain inspiration or ideas for your own LinkedIn profile. You should read the profile of someone you are meeting, for an upcoming interview or for networking, in order to find ways to quickly connect over similar background or interests. You may not want them to know you were reviewing their profile. To view a profile without that person knowing, go to your privacy settings, click the option that says “select what others see when you’ve viewed their profile” and change the setting to “anonymous”. How can I be “found” for job opportunities by updating my LinkedIn profile -but without signaling or alarming my current employer? -Before updating your profile, adjust your privacy settings by hovering over your image on the far right of the top toolbar and click on the privacy and settings option. You can now post any changes to the profile without LinkedIn alerting your whole network. What if my computer skills are not very good yet and I must find a new job? The City and County of San Francisco offers computer training at library branches, recreation centers and City College campuses. Many nonprofit organizations also offer computer training: see CTN Bay Area Directory or the SFPL Community Services Directory for listings. The San Francisco Public Library offers free computer training classes at the Main Library and various branches. The San Francisco Recreation & Park Department offers computer classes for youth, adults and seniors at various recreation centers. What if my English skills are not adequate? We refer potential job seekers to other non-profit organizations for additional English, especially to those programs that serve the immigrant community. Employment authorization: What if I do not have a green card or permanent residency status or other work authorization to work in the USA? The Job Forum is not able to advise job seekers regarding work documents. We refer potential job seekers to https://www.usa.gov/green-cards or suggest researching with immigration attorneys. I hate networking; do we really have to network in order to get a job? 1. Employers would rather hire those who are known by someone they know. They believe that the best candidates are likely to be those referred to them, especially when referred by someone employed working in the company already or someone in the industry or a colleague with experience in a similar job field. 2. Employers don’t have time, and don’t want to take the time, to go through all unknown resumes from a job posting. The ease of the digital applications process means that one job posting can result in thousands of responses to a company opening. Employers admit it is more efficient and culturally relevant for their company to ask their employees or receive internal referrals; they believe that will help them to find high-quality candidates. So the implication is networking is the way that the job seeker can directly increase the chances their resume and candidacy will actually be even considered at all. 3. There is a hidden job market with some jobs never posted or advertised. There are many estimates of job openings filled internally or via referrals and never externally “announced”. The way to know about the jobs you may want, is to network so people you know (or people you meet) will tell you and think of you when an opening is about to be available at a company on your target list. An internal networking contact sending your name or resume to the internal hiring manager helps you to get noticed. You network to get to know people in the organizations you are targeting and then, when applying for specific jobs, you tell your network contacts about the job you are applying for and ask them please to send a referral for you to the hiring manager for that job. By networking you can gather information on the company culture and priority challenges so that you can better communicate your fit. Where does the Job Forum suggest we focus our networking? The Job Forum panelists have experience and believe there is a clear benefit to focus and targeting. So we suggest that you network where you are going to meet people from the organizations or within the field with job titles at the level you want to work. -The San Francisco Chamber of Commerce welcomes members and non-members to some meetings for networking purposes. Visit www.sfchamber.com for a calendar of events. 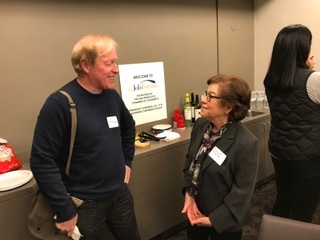 Every meeting of the Job Forum is an opportunity to network with other job seekers and with volunteer panelists who work in SF Bay Area companies. What if I don’t know what I want to do next in my career? Many people face this same question and the Job Forum panelists are very skilled in brainstorming alternatives and suggesting job titles or fields for you to consider. We will demonstrate how to think practically and develop an action plan to conduct informational interviews and background research to narrow down or to open up your choices so that you can make progress.